Who owns Majestic Kilimanjaro Treks & Safaris? Majestic Kilimanjaro Treks & Safaris is owned by Tumaini Sandi, born and living in Tanzania and Steve Giles & Liana Di Stefano from Sydney, Australia. We are incorporated in Tanzania and all profits stay in Tanzania. Steve and Liana take no income or profit from this business and instead donate it all to our Foundation which funds and organises local community work in Arusha Tanzania. Our guides have years of experience in leading treks and climbs on Kilimanjaro and safaris in Tanzania. They all have a love for their country that they take great pride in sharing with visitors. We promise we will work harder, from your first contact with us, to ensure that your experience is a great one. We will not be complacent with your expedition. In 2011, Steve & Liana achieved one of their major life goals and retired at the age of 49. In December that same year they summited Kilimanjaro with Tumaini as their guide. "In conversation with Tumaini over the many hours of walking, we found out that it was his dream to have his own trekking company. He knew it would take many years before he could save enough money to make this a reality. Steve, my Husband, was the one who was the trekking enthusiast having already trekked to Everest Base Camp, and the Kokoda Track in Papua New Guinea. I had come on the trek with great reservations about my ability to summit. I had trained before hand, but was still not confident. The attention and level of service Tumaini provided meant that Steve could focus on himself. In his gentle, unassuming way, Tumaini reassured and kept me going. It wasn't all hard work, we laughed lots and enjoyed the spectacular changing scenery. Tumaini, hard working, well educated, intelligent and deeply humble touched our hearts. We both knew that with a little assistance he would be successful. So we decided to offer him the opportunity to be a partner in his own company and he accepted. Steve and I recognise that we are fortunate to have been able to retire, so we take no income and profits from our share of the company are put towards works in Tanzania, currently the New Paradiso Orphanage which is home to 24 children and our Porters Scholarship Program. This program pays the full tuition fees for Porter education in learning English, driving school and a trade or career of their choice. We also pay them an allowance so they can continue to look after their family whilst studying - an opportunity most Porters never have the chance to do. Life also took us to Uganda in 2016 and we now run a Learning Centre that teaches English literacy and numeracy as well as computer training for free. We have 80 adult students enrolled who are refugees and locals. We also started a small business loans program for refugees. The businesses are varied and include a plastic recycling business, shoes, green bananas (matoke), pig food and beaded bags. These loans make a difference very quickly to the lives of the families involved. Of course, not all of the businesses work well straight away but we stick with them and do our best to provide some mentoring to help them get through the considerable roadblocks and set-backs they face in trying to do business as a refugee in a foreign country. " Please consider Majestic Kilimanjaro for your trek and safari. We promise to do all we can to make it an experience you will always remember well. P.S. Here are some reasons to choose us for your Kilimanjaro climb or safari. Tumaini Sandi originated in Southern Tanzania and moved to the northern side of the country when he was two years old. From an early age Tumaini and his family spent an annual vacation at Lake Manyara and Serengeti National Park. These vacations imprinted on him a passion for wildlife and trekking which has remained with him all his life and formed the basis of his career. Tumaini, joined the safari industry after becoming qualified as professional guide at the Professional Tour Guide School in Arusha. He attended further wildlife training in Northern Serengeti at Mwewe Ranger Training School. He has guided safaris in Tanzania and Kilimanjaro treks with big companies including &Beyond, Nature Discovery and others for over 5 years and climbed Kilimanjaro more than 100 times. 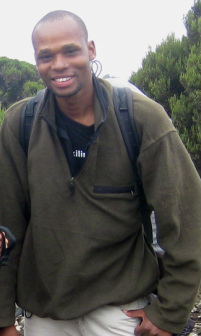 Today, Tumaini is the Managing Director and a founding member of Majestic Kilimanjaro Treks & Safaris. With his knowledge and experience, Tumaini guides as well as works on the ground in Tanzania to ensure that Majestic Kilimanjaro provides exciting safaris and treks to all our guests. Steve Giles has been a successful business man and keen trekker for many years, having trekked to Everest Base Camp in 2007, The Kokoda Track, Papua New Guinea in 2008 and Mount Kilimanjaro in 2011. He also completed the Oxfam 100 km in 48 hours walk in 2010. With his team, Steve raised $7,000 and completed the challenging bushland trek in 33 hours. Recognising that Tumaini will often be leading climbs on Kilimanjaro or safaris, Steve will be available to answer your email queries and provide quotes so that you receive a prompt response. Liana Di Stefano's background and experience is in working with businesses to ensure their success. She worked as a consultant in the corporate world for 12 years advising clients on corporate culture and leadership. Prior to this she had her own business from the age of 24 providing business and personal development programs to individuals and organisations. A late bloomer in the area of trekking, Liana summited Kilimanjaro in 2011. Liana and Steve went on a 5 day Safari with Tumaini in Serengeti, Tarangire, Lake Manyara and Ngorongoro Crater. As part of their trip to East Africa they also enjoyed 5 days in Zanzibar and so have experienced all these areas first hand. Liana is responsible for Majestic Kilimanjaro's marketing and social media. 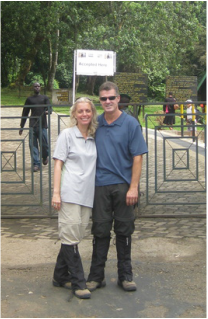 Both Steve and Liana reached financial independence in 2011 and so the work they do with Majestic Kilimanjaro is done in order to contribute to the community in Tanzania.